If you are looking for the natural and healthy sugar supplements while you are an expecting mom, then you are on the right page. Jaggery is not only safe during pregnancy, rather it even does a world of goodness. Jaggery which is well known as Gur is the well-accepted ingredient to use in all sorts of desserts. In these days, its usage has become more popular as people are getting health conscious. 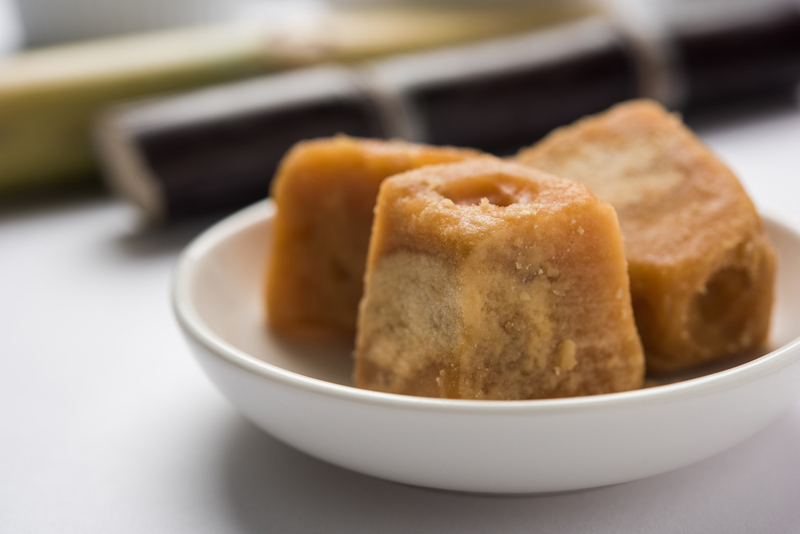 Jaggery is made from sugarcane juice, without separating the molasses and crystals. It can be extracted from palm trees as well. When it comes to health benefits, palm jaggery is said to be more beneficial. Jaggery has been used extensively in different parts of Asia, Africa and some parts of America. This product is mainly used to make yummy dishes and especially sweets. Your sweet tooth will never be a curse if it craves for jaggery. As jaggery is jammed with an array of minerals like calcium, magnesium, phosphorus, sodium, manganese, zinc and iron. The list didn’t end here, and it has many vitamins like A, B1, B2, B6, C, E and many more. Did you know its iron content, to the most part happens during the processing of jaggery? However, other minerals in jaggery come directly from the source and remain as jaggery doesn’t go through any fermentation process. Yes, it is completely safe to have jaggery while you are pregnant. It helps you to get rid of iron deficiency. If you add jaggery to your diet, you will not be facing the problem of poor nutrition through your pregnancy journey. When To Start Incorporating Jaggery To The Pregnancy Diet? Jaggery is the most natural form of sugar. Therefore, it poses no risks of the artificial sweeteners and can be considered as the healthy substitute for the white sugar. However, it is usually recommended to incorporate into pregnancy diet from the end of the first trimester, after two months of pregnancy. Can Eating Jaggery During Pregnancy Bring Down the Birth Weight of Baby? No, in other terms, it increases the side of the placenta and gives a healthy environment for the babies to grow. In the recent years, we have stopped the intake of jaggery. But this natural sugar adds taste to your every dish and liquids you have. What Are The Health Benefits of Jaggery During Pregnancy? Regulates Blood Pressure: Having accurate blood pressure is very important while you are expecting. Take jaggery in your routine and this helps you to get rid of stroke, kidney stones, and other heart-related problems. Jaggery has fewer sodium levels and helps you to get the required goodness. Rich in Antioxidants: Jaggery is rich in antioxidants. Therefore it helps to prevent cell damages and protect the health of the fetus. Furthermore, antioxidants help to boosts the immunity of the mother, thereby, help to keep common infections at bay. Facilitate Digestion: Your every problem with digestion will be curbed as you take jaggery. The natural sugar causes the secretion of digestive enzymes and this trigger proper digestion. A great news is, one can get rid of constipation as well because of jaggery. Brings Down Joint Pain: Jaggery is used to strengthen the bones and joints and taking this is very helpful for pregnant women. Bid adieu to joint stiffness and every bone problems which you are facing with. Helps in Maintaining Electrolytic Balance: Electrolytic imbalance is the root cause of several serious pregnancy issues. The presence of potassium and sodium of jaggery helps to maintain the electrolytic balance. Provides Benefits of Magnesium: Magnesium is useful for the nervous system, muscle movements, protein formation, and energy creation. It is essential to combat mood swings. Reap all these benefits with the magnesium that is present in Jaggery. Prevents Anemia: Anemia is the most common, yet serious pregnancy issue faced by many expecting mothers. As the blood volume increases up to 50% during pregnancy, low in the RBC count can bring about anemia. Take Jaggery as a substitute for sugar, so that, you will never have to face Anemia problem again. Being rich in iron content, regular consumption of jaggery helps to enhance the RBC count. Cleanses the blood: While you want your little bundle of love to grow in a healthy place, you need to flush toxins and waste from your blood. This is possible by eating jaggery in required amounts. Combats Inflammation: The diuretic property of jaggery helps to fight against inflammation naturally. Thus your pregnancy pains will be relieved if you incorporate jaggery into your diet. Rich in Folate: If you want to increase the intake of folate in your diet, then stop all your searches and just go with jaggery. Reduces water retention: The presence of potassium helps in reducing the water retention problem in expecting mothers. This is, in fact, the most common problem which is faced by everyone. Aids in Enhancing Bone Density: Jaggery which is plenty of minerals that entail calcium, magnesium, and potassium helps in adding much strength to your bones. It is useful to reduce problems even when you get old. Cashew Bytes: Fry cashews in little ghee and off the flame as the cashews turn to golden color. Try making jaggery syrup with little water. Boil this syrup until you get the string consistency. Add the fried cashews, a spoonful of ghee and a pinch of cardamom powder as you turn off the flame. Kheer For Crazy Health: Cook either rice, millets, broken wheat separately. Add this cooked rice of any variety or millets, broken wheat in milk added with jaggery. Boil the same for 5 minutes and add a spoon of ghee before turning off the flame. Add pan fried dry fruits for the crunchy taste when you serve. Add jaggery based on the sweetness you wish to enjoy. Divine Combo: Coconut and Jaggery: Fry grated coconut in a spoonful of ghee. Once the grated coconut changes its color slightly, add grated jaggery and mix well. Add cardamom powder and off the flame once you get the yummy, aromatic gooey consistency of the mixture. Jaggery is considered the best option when you like to have sweets. This is even considered as the natural method to get rid of iron problems and to get immense health besides enjoying its taste. So, stop getting and using sugar and replace it with jaggery. Previous ArticleIs Peanut Chikki Good During Pregnancy?